Sooner or later you will want to develop and enhance your rugby core skills and qualities. You may find this information is useful. Hold the ball securely from the moment you touch the ball. When you pick up the ball you do it with the "cage grip". Fingers form a cradle underneath, thumbs press the ball into the cradle. Hold it like that and you hold on to it, no need for adjustments. You will be confident when you hold the ball. The more you practice, the more you will be confident on the field, in a game. 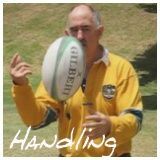 You`ll find the details at rugby handling. When you are the ball carrier on the field (the player in possession of the ball) be sure you handle the ball well so you keep possession. Make sure you can handle the ball in any situation by practicing often. This video will help with some ideas for how you cope with all the wierd situations that occur in a game of rugby. Do it often by yourself with a one person rugby handling class. One of the most important of the rugby core skills. When you are able to control the ball well when it has been passed to you in different situations you`ll feel confident. The ball is moved around a lot in rugby so being able to catch the ball in many different circumstances is an important part of your game. Look for the catching skills section on the main menu. This is a very important area of rugby core skills. When you pass the ball well you can safely move it to a player better placed than you are and so use the ball to the best advantage as a team. 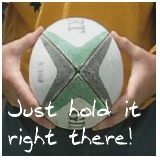 "Let the ball do the work" is a saying in ball games like rugby. It means move the ball around with well judged passes and you will break defences because the ball can move faster than players. The aim is to get the ball into the hands of a player who is opposite a weakness in the opposition defence. Ideally the player carrying the ball will simply run through a gap between opposition players and score. You`ll find passing skills on the main menu. An important and expected part of rugby core skills. Moviing fast with the ball rugby ball is not the same as just running. When you run fast you will tend to use the one arm carry. It allows high speed running and gives you a free arm to hand-off would-be tacklers. When you know what to do, do it often. Take every opportunity. Have your own ball so you can carry it when you go running. Do plenty of running, get plenty of practice. Also be prepared. Scan the situation constantly so you`re well informed and make good decisions. When you pass well to a supporting player you create an advantage. All the small advantages you create go to winning the game. Perhaps one of the surprising core rugby skills. You can make an attack successful even without the ball. Think through when you run and where you run so you create options for the ball carrier and make the defence worry about you. Tune in to the ball carrier. 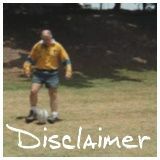 Assess their most likely actions and assess the state of the defence. Plan your running using the information gathered so you give your best possible support. Then you`ll be in the right place at the right time. There`s more about this in rugby support play. Practice these rugby core skills constantly. Until you do them all well. Do loads by yourself. Amaze everyone with your skill. You`ll be an expert, full of confidence!!! Along the way build in the skills of tackling, kicking and especially evading - "the sidestep". It`s worth knowing more about "the how to" of improving rugby skills. You need it to build your core skills and to win games. coupled with the ability to "keep at it"
and you feel "you`ll get there"
Then, with that in place concentrate on what you are doing NOW and enjoy it! Very important for a team game like rugby! Imagine two groups of people each with a large rock to be moved. Imagine one group is made up of brilliant individuals each convinced their abilities and ideas are best and no interest in listening to or helping others - no team. First group, not an enjoyable place to be. Imagine the second group, made up of mixed individuals each with their own range of abilities and ideas, prepared to listen to others and to co-operate to achieve a common aim - a team! Second group, seems like a recipe for success! Be genuinely concerned about team-mates. empathise, encourage and console when mistakes happen "hard luck, no worries...you`re getting it..."
If the other player is clearly not at your skill level maybe offer advice, as casually as possible! "I do it like this...that often works..."
If you`re less skillful, ask for advice. "I`m trying to improve my kicking/passing/etc.. you seem pretty good...have you got any tips?" Run well when you have the ball, the straighter towards the opposition goal-line the better. You make ground faster, you`re harder to tackle and you don`t take your team-mates ground! They want to play as well. It doesn`t help if players run across field all the time. Look hard for team-mates better placed. If it`s the best thing to do, make sure you give them the ball! Be prepared to listen to and act on suggestions from other players. Gymnasts may not spring to mind when you think of rugby. Maybe you take part, great. Maybe, just maybe, reading and thinking about rugby skills from gymnastics will help you improve. Basketball may also help. Basketball players develop skills and qualities that are useful in other sports. I also learned a lot related to rugby core skills and qualities in just one running race which helped me both in rugby and many other things. You may find this useful the loneliness of the long-distance runner - rugby goals for fitness .